Audio archives of "For the People"
As I explain in my article about Richard Hoagland, during the timeframe of these audio excerpts, Hoagland was serving as Science Advisor to the For The People radio program, which was based in Cedar Key, Florida, and broadcast daily across the United States on the Sun Radio Network (and worldwide via shortwave). 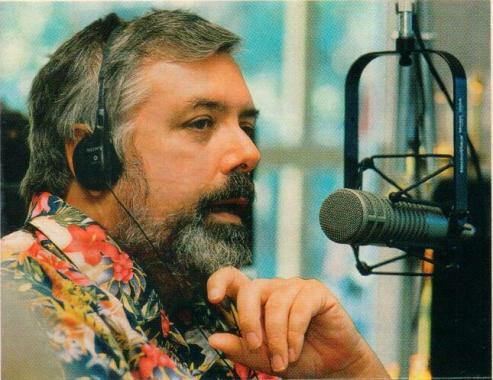 Hosted by Chuck Harder, this "overheated radio talk show" (as described by Alex Heard in his June/July 1991 Air & Space Smithsonian article) was devoted partly to useful consumer-oriented advice, and partly to conspiracy and fringe-science themes such as UFOs, suppressed cancer cures, and perpetual energy machines. Given the nature of much of the subject matter, the program's Florida roots, and my position as founder of the Tampa Bay Skeptics, I began taping some of the broadcasts, saving and cataloging the most preposterous comments, winding up with nearly five hours of the following "Greatest Hits" snippets, many involving Hoagland (some of which were used in Alex Heard's article from tapes supplied by me in response to his phone call). Some of the programs were taped from the show's shortwave broadcasts, accounting for the occasional odd sounds and fluctuations in audio quality. Unless otherwise noted, the voice you hear will be that of program host Chuck Harder. If you are interested in only the excerpts involving the featured character in my article, Richard Hoagland's name appears below in red. Bonus: Hear Hoagland and radio host Art Bell blatantly lie about me in two audio snippets on Coast to Coast A.M.
Jan. 23, 1990: 00:02: John Lear's reputation ("real straight shooter"). 00:27: What the ETs are doing to abductees. 02:16: U.S. experimental beam that "upset the systems" of UFOs. 03:13: Govt. people have "leaked" info re: our bargain with the ETs. Jan. 24: 03:47: The Russians believe in the ETs and the Japanese may soon reveal what the U.S. is keeping hidden. Jan. 29: 04:28: Respects Bob Lazar as one who tells the truth. 05:12: John Lear's credibility. 05:35: "I don't propose that I am an authority . . . and I don't speculate." 05:58: "Cold fusion." Jan. 31: 06:46: CIA report says scientists in Russia are "extremely concerned" about UFOs. Feb. 7: 07:19: Bob Lazar was formerly a U.S. government scientist. Feb. 9: 07:34: Caller skeptical of Billy Meier's phony-looking UFO photos. Harder says it would cost $250,000 to have faked them all, that Atlantic Monthly commissioned someone to debunk them (but couldn't), and that "lab reports" indicate they are real. Feb. 14: 12:41: U.S. Watergate-style conspiracy to hide cancer cures may lead to revolt like the one that overthrew the Soviet Union when the truth comes out from other countries. Feb. 16: 13:39: "Unbiased" research in his magazine about the hidden cancer cures. Feb. 23: 13:59: Harder in conversation with KLAS-TV (Las Vegas) newsman George Knapp incl. Soviets have pieces of a "crashed flying saucer." 15:40: "Snowbird" document may be declassified, confirming testing of alien technology. 16:13: Weekly World News article on photo of a World War II bomber on the moon. Feb. 26: 17:11: Harder reads a registered FOIA letter he sent to NASA about its apparent withholding of evidence of alien visitations. Mar. 5: 21:07: SETI is a good opportunity to "come clean" now about what we found long ago but can claim we just found. Mar. 6: 22:20: News story about devil worship and exorcism case. 23:46: Conversation with Charles Redmond/NASA re: Gulf Breeze and UFOs (Redmond denies any NASA UFO evidence). Mar. 6, 1990: 00:02: Continuation of Harder's conversation with Charles Redmond/NASA. 00:56: Harder questions Redmond's truthfulness. Mar. 8: 01:56: Discussion with a skeptical caller re: James Randi. Also mischaracterizes part of March 6 conversation with Redmond. Mar. 9: 05:07: Brain implants by ETs (miniaturized microchips). Mar. 16: 06:06: Praises Stanton Friedman, Walter Andrus and Brian O'Leary (he mistakenly says "Timothy Leary") re: UFOs ("We've pretty well figured it out"). Also discusses TASS report of a UFO landing witnessed by perhaps 100 people. Mar. 22: 07:51: Japanese pilot UFO sighting. Ridicules Philip Klass. 08:59: About 15,000 documented cattle mutilations, done with surgical laser precision, apparently by ETs. 11:44: Mischaracterizes his interaction with me (not by name) re: Cash-Landrum UFO radiation case. June 8: 12:37: ETs apparently "blinded" a Russian Mars probe. Believes "Gorbachev and Reagan talked about it at great length." 13:59: Discusses Carl Sagan's possible belief that Mars "was inhabited once." Believes Sagan is paid by the U.S. goverment, and hence his reticence to discuss this belief. June 19: 15:33: Disparages "the professional skeptics" but admits there have been "some hoaxes." June 20: 16:09: Interview with Ed Walters about the Gulf Breeze UFO case. Walters claims that skeptics (not he) created the UFO model that was "planted" to discredit his photos. 19:25: Harder and Walters discuss Philip Klass. 21:35: Discussion with callers re: Phil Klass debate being planned for his show (it never materialized). Describes Klass as "intimidating" and as one who "slanders." June 27: 26:15: Discusses a UPI International article saying that two schools will be testing a five-seat "flying saucer" next summer (1991) and will have it manufactured by 1996. It will travel "26 times the speed of sound." 27:04: We have alien technology "without question." "The stuff at Cape Kennedy is [just] a distraction." Says we have spacecraft that "routinely" go to the moon and return in a few hours' time. July 3: 28:49: Discussion with George Knapp re: Bob Lazar. Knapp rates Lazar's reliability as "at least an 8." July 3, 1990: 00:02: Continuation with George Knapp. 01:10: "[Bob] Lazar was working on an alien vehicle" in Area 51 01:51: Project Blue Book scientist has told Harder that Blue Book was "sanitized, meaning that the good stuff was left out." July 4 (rerun from spring): 02:11: World's governments are moving quickly to let us know that we are not alone. Invokes comments by President Reagan. Calls Ed Walters' book "excellent." 03:38: NASA finally releasing UFO material, incl. recent shuttle transmission about "an alien craft alongside of us." 04:40: By 1992 America will be told the full story. 05:33: The "Wildman of China" (more human than ape) is real. July 6: 06:29: Hoagland on OMNI article re: Mars. Says they credited Carl Sagan for his (Hoagland's) work on "the pyramids and all the other things that are there" at Cydonia -- "the height of editorial irresponsibility." July 13: 09:09: Hoagland on how Reagan's reference to aliens ties in with his Mars work. 12:14: Hoagland re: addressing NASA, including "major national NASA education conference," his PBS show, NASA's John Klineberg's remark about the President, "groundswell of official NASA interest" in his work. 15:04: Harder comments about my (not by name) "scathing" letter (read it here) in response to his "kindness." 15:47: Ridicules the word "anecdotal." 16:13: Hoagland on how NASA keeps inviting him back to brief their engineers and scientists. 17:05: Hoagland re: Sagan possibly hinting at a formerly inhabited Mars, and again refers to the OMNI article. 18:15: Hoagland on Sagan taking credit for the Pioneer plaque. 19:59: Hoagland now the official "Science Advisor" to Harder's radio program. July 20: 20:24: Hoagland on OMNI article again and says reporters are currently pursuing Sagan for comment re: the article's linking Sagan to the objects at Cydonia. July 25: 22:01: Skeptical caller re: astronomers' disbelief in UFOs. Harder discusses Sagan's OMNI quote re: Mars. 23:41: Recent Gannett newspaper article quoting a congressman and others about the monuments on Mars being real, and a cover story in Applied Optics about the photos of Cydonia. July 27: 25:08: Harder/Hoagland/Colin Andrews on ties between the "complex on Mars" and crop circles, specifically Alexander Thom's Megalithic yard (2.72 British feet). Aug. 1: 26:56: Again talks about a craft that can make a round trip to the moon in a few hours, but this time says he has only one source and that he could perhaps be a "crank." Mentions the Aurora craft and again says the stuff at "the Cape" is just to divert the press. Aug. 13: 27:45: Discusses the Cash-Landrum UFO radiation case again. 29:28: Says there are photos of UFOs picking up cattle. Says the purpose of his show is to "tell the American consumer what is coming." 30:25: Two Russian pilots have subsequently died after encountering a UFO and its beam. Aug. 22, 1990: 00:02: Billy Meier's UFO wreckage disappeared but more is available. Recommends Howard Blum's book Out There. Sept. 7: 01:38: Hoagland on his upcoming NASA educational talk re: a perpetual-energy machine ("N Machine") that can "reach into space-time and convert direct electrical energy from the basic properties of the space-time continuum." 02:55: Hoagland on Dr. Bruce DePalma and N Machines that "create energy, apparently, out of thin air," and ties this in to the "set of equations" decoded from the Mars monuments. Emphasizes his invitation to present this info to NASA. 06:21: Hoagland says Indian government to unveil such a machine in 4-6 weeks. 08:06: Hoagland says Joe Newman is on to the same theory. 09:08: Hoagland says Indian machine puts 5 KW in and gets 30 KW of energy out. 09:48: Hoagland says this all ties in to the Cydonia equations on Mars. Machines open a gate to the 4th dimension. 11:30: Interview with Bruce DePalma. Mentions Indian machine. Says he has his own machine in his garage but doesn't use it to power his house because the gov't. would confiscate it. 14:40: Hoagland on his and DePalma's upcoming NASA presentation and their request that NASA test the N Machine (says NASA has "agreed in principle" to do so). 15:25: DePalma on simplicity and economy of making N Machines for powering cars forever, etc. 16:26: DePalma says an N Machine is now operational on western coast of India. Sept. 10: 17:06: Caller says Phil Klass is a "government agent." Harder again says a Russian plane was "bathed in a blue beam of light" from a UFO and the pilot and co-pilot died, and that Russian cosmonauts have reported UFOs alongside their spacecraft. 19:50: Suggests that Klass "get involved in [covering up] the Salmonella epidemic" (like he allegedly does re: UFOs) that has killed 9,000 people but is being covered up by the chicken industry. Sept. 17: 20:27: Hoagland on NASA conference re: "packed auditorium full of teachers and scientists and engineers. . . . [NASA's] Dr. Anderson made a very big point of congratulating me, of expressing his interest in our work. . . . I and Carl [Sagan] now both have our own miniseries." Says Hoagland's Mars miniseries to air on PBS stations. Late Sept. (date uncertain): 24:41: Hoagland on crop circles and relationship to Stonehenge. 27:22: The number "2.72" ties in to crop circles, Cydonia's monuments, and tetrahedral geometry. Late Sept. 1990 (date uncertain): 00:02: Harder about his recent letter to me (not by name) alleging I am "not interested in even the possibility" of his reporting being true, and the damage skeptics do (from his letter to me of 9/25/90 that is stamped "Not to be copied or disclosed"). 01:24: Hoagland says his side admits they don't know it all, but the skeptics claim that they know it all. Oct. 2: 02:11: Hoagland discusses his "stunning" Mars findings, but says that others "are not playing fair with this data." Oct. 5? (date uncertain): 03:57: Hoagland on the Mars mathematical puzzle being solved and tied to crop circles, possibly created by UFOs. 04:50: Hoagland on 3- vs. 4-dimensional universe, the Big Bang, and the N Machine (tied to his "Cydonia equations"). Re: the laws of conservation of energy, "They are quoting things out of textbooks and the textbooks are wrong." Oct. 16: 11:27: The Russians apparently have UFO wreckage of "at least one [that is] rather complete" and have released pictures and laboratory analysis of "pieces of another," which FTP is publishing, along with a TASS story about a cosmonaut's report that a UFO pulled up to his Mir spacecraft. Oct. 22: 29:39: Harder discusses the above Weekly World News interview. Says he "had fun with it" and doesn't necessarily vouch for the reality of everything in that "entertainment" tabloid. 31:01: Mentions "respected physicist" Stanton Friedman's MJ-12 report. Oct. 22, 1990: 00:02: Harder on AIDS possibly a manmade virus. Oct. 26: 01:33: Hoagland on all new Navy ships being powered by N Machines "under top-secret black programs." Encourages listeners to buy FTP's book about the machines and to lobby their Congressmen to get NASA to publicly demonstrate these machines. Harder on the use of the monies derived from book sales. Nov. 9: 04:38: Hoagland says "first installment" of Hoagland's Mars miniseries set for Jan. 6. Says this week's Unsolved Mysteries show to be a special on Mars. Says Presidents Gorbachev and Bush have a "secret," maybe about Mars. 06:54: Harder and Hoagland on skeptics of N Machine, Mars, cold fusion. 09:27: Hoagland says Stanford and labs overseas (in Rome, Tokyo, etc.) are confirming cold fusion. Thinks this might tie in to his Cydonia physics and the N Machine. 10:54: Hoagland says skeptics like at Skeptical Inquirer "never do the experiments," just take pot-shots. [Note: The author did experiments.] 11:22: Hoagland says Edwards AFB team going to DePalma's to test N Machine "regardless of what the Skeptical Inquirer says." Nov. 16: 12:30: Hoagland on the Pioneer 10 plaque and how it may tie in to crop circles: "Just suppose the plaque was read by someone [who is now] paying us a visit in kind and leaving its messages [in crop circles]." Suggests we respond to them by making "pictograms" based on his Cydonia mathematical patterns. 13:54: Hoagland on positive cold fusion experiments at Stanford, Rome, Tokyo, and elsewhere. 15:14: Hoagland on "stunning evidence" to come from the Mars Observer photos. [Note: The Mars Observer mission failed but others have subsequently succeeded.] 16:30: Hoagland says NASA will be showing Hoagland's Mars to prepare the public for the truth to come out soon. 18:33: Hoagland on how the N Machine creates energy by "open[ing] a gate to the 4th dimension" due to its rotating magnets' double tetrahedral pattern, "which is the heart of our Cydonia equations." It also causes "the slowing down of time." 20:43: Harder on his having predicted, last summer, a major October 1989 UFO event, "and of course the Russians announced that a UFO landed in their country." Discusses FTP's magazine's photos of pieces of a crashed UFO in Russia. 21:35: Harder on photos of UFO fly-bys. Nov. 21: 12:14: KLAS-TV newsman George Knapp's TV series on UFOs has won awards from AP and UPI. ABC-TV is going to use some of Knapp's footage for a show about Area 51. Nov. 23: 24:39: The government and press are warming us up for the truth. George Knapp's awards. 25:24: U.S. Navy planning to use N Machines to power ships. 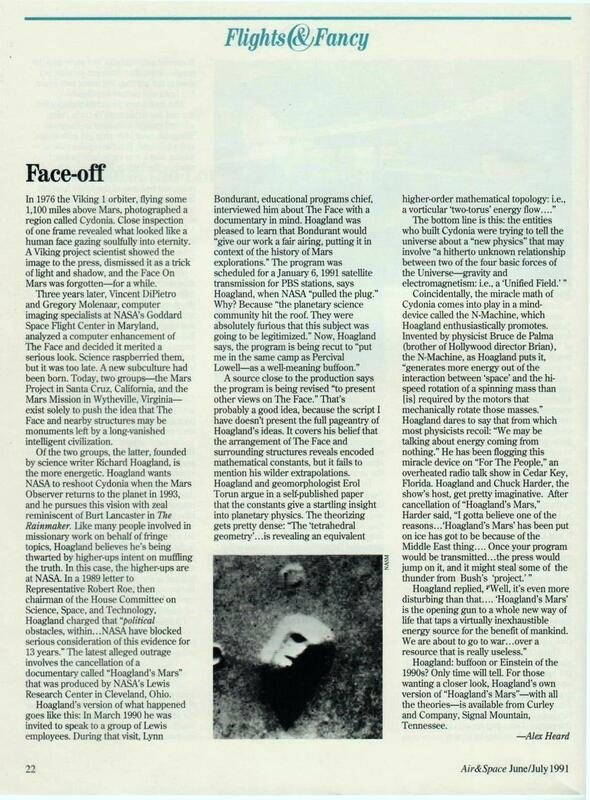 Dec. 14: 25:44: Hoagland on Hoagland's Mars being canceled for now by Dr. Robert Brown (NASA's Director of Education). Says Dr. Bondurant (NASA/Lewis Chief of Education) is "distressed" over the cancellation. Urges listeners to call Dr. Brown. Dec. 14, 1990: 00:01: Continuation with Hoagland re: Mars/NASA. NASA had also tried to get him "uninvited" from his first appearance there but reversed decision after "intervention of a few key reporters." 02:05: Hoagland on "NASA Alert" presentation at NASA/Lewis for its 4,000 employees. 03:38: Hoagland on new enhanced Cydonia images (like a helicopter 3-D flyover). 04:49: Says "Carl Sagan's people" want that "flyover" footage for an updated Cosmos videocassette release. 06:10: Says his data is "stunningly upsetting" to contemporary science. Cydonia to be rephotographed during 1993 Mars Observer mission due to his lobbying of Congress. 07:29: Hoagland on what if NASA has known since 1976 about the Mars monuments and has kept it secret. 08:24: Harder and Hoagland on Hoagland's Mars being canceled because its revelations re: the N Machine would eliminate the need to import oil from the Middle East. 11:03: Harder getting calls re: N Machines being constructed in university classrooms and generating so much electricity that one "started burning up the wires." 12:06: Hoagland on Edwards AFB physicists impressed with DePalma's setup. Impending Mideast War will be over unnecessary oil, so Hoagland's Mars needs to be aired ASAP. 14:26: Says Dr. Tewari's N Machine in India is being used to split hydrogen and oxygen from water, to then be stored for future recombination in fuel cells. N Machine technology will thus be leading to "commercially viable products in a very short time horizon." Harder summarizes, "Ladies and gentlemen, we're trying to save America." 16:18: Hoagland on Dr. Bondurant "in agony" over cancellation of Hoagland's Mars. 17:24: Harder has heard that NASA has held up Hoagland's Mars until it can scrutinize the tape for suspected promotion of Hoagland's Monuments of Mars book in it because "NASA cannot promote commercial ventures." Hoagland denies any such promotion. 19:14: Hoagland on new ABC-TV series this spring called America's Best-Kept Secrets. They have been in discussions with him about Cydonia. 20:00: Says he has found one passing reference to his book in the Hoagland's Mars script. 21:00: Doubts NASA will "have the courage" to release the Cydonia photos from Mars Observer in 1993 [Note: This mission failed but others have subsequently succeeded.] 21:52: Says he didn't want his book promoted in Hoagland's Mars. Dec. 20: 22:18: Hoagland on production of Hoagland's Mars and its subsequent cancellation. 25:05: Says it is a "lie" that he used Hoagland's Mars to plug his book. 27:05: A NASA source has told him that the real reason for the cancellation is that "the planetary community . . . pitched a fit" that it would provide Hoagland with "unwarranted legitimacy." 30:12: Discusses what the press and public can and are doing to try to reverse NASA's decision. Dec. 20, 1990: 00:01: Continuation of Hoagland discussing what the public can do to try to reverse NASA's decision to cancel Hoagland's Mars. 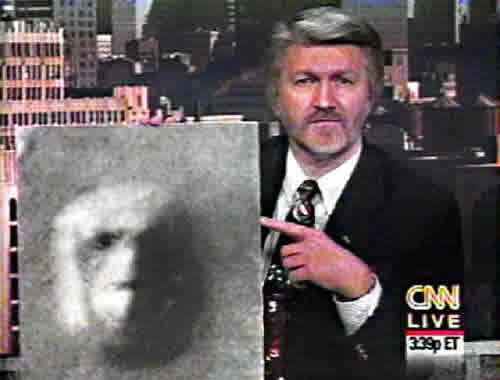 01:04: KLAS-TV newsman George Knapp re: his UFO-related TV specials and awards. 02:47: ABC-TV has "caught wind" of Knapp's reports about the "testing of alien technology by government scientists" at Area 51 and is preparing a one-hour special. 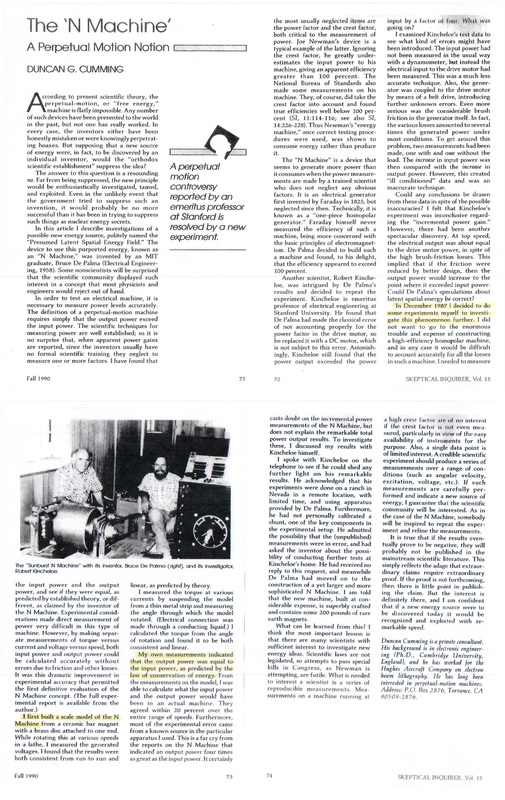 03:39: Knapp on recent Aviation Week & Space Technology article ("the magazine Phil Klass writes for"). They sent a team to the Nevada desert to "pursue these stories about things that look like flying saucers . . . perhaps experimental craft, flying in the night sky." The drawings in their article "look remarkably like what [Bob] Lazar said he has . . . been working on" and like the craft recently reported being seen flying in Belgium. Dec. 21: 04:55: Harder's For the People will award a 100-oz. silver bar (donated by Jim Miller from Anchorage, Alaska) to anyone who can bring FTP "a working model of an N Machine." Later in the program says that one of his listeners saw on local TV that there is one in Tulsa, Oklahoma, and that "We're now talking to the fellow who has it." Dec. 28: 06:45: Harder interviews Troy Reed (Tulsa, Oklahoma) about his magnetic motor. Generates more energy out than in and can power a car or even a home. Harder tells him, "You are going to be a very, very wealthy man." 15:14: Hoagland comments on Troy Reed. Thinks his motor, like the DePalma N Machine, opens a gate to the 4th dimension. Jan. 2: 19:46: Hoagland on the "distorted" reediting of Hoagland's Mars to make him look "deluded." Considering legal action. 26:35: Harder thinks NASA is doing this because they weren't the ones who made these fabulous discoveries about the artifacts on Mars and "their egos prevent them" from giving due credit to Hoagland. 27:14: Hoagland suggests that a Congressional inquiry about all this is in order. Asks listeners to write to NASA and Congress. Jan. 4: 28:52: Hoagland on NASA "cover-up" by reediting Hoagland's Mars. 30:41: Hoagland is planning to release his own Hoagland's Mars if NASA doesn't. 31:03: Harder on UFOs in Nevada "not from [Earth]." Feb. 22, 1991: 00:01: Hoagland says NASA will be showing "their version of Hoagland's Mars." May possibly constitute "a cruel hoax on the American people." Mar. 1: 01:49: Hoagland says there will be a "Russian customs" station at the monuments on Mars if they beat us there. 02:32: He and Harder discuss how the Russians plan to eventually redirect their manned Mir space station out of earth orbit and to Mars (and NASA is keeping that plan from us). 04:45: Discusses reasons for getting serious about going to Cydonia. 06:30: Says we are now "making significant political progress within NASA" regarding the monuments and mathematics of Cydonia. Says we risk the Russians alone getting there and "develop[ing] that [Cydonia] technology." 07:31: Discusses the additional $12-million funding for SETI. Not enough "honesty" from NASA about "who knows what." 08:09: Harder on TASS report of Russian cosmonauts encountering a UFO, and Hoagland comments skeptically! Mar. 7: 09:58: Harder explains that his listener-supported, nonprofit For the People (not the radio network) pays his salary. Mar. 8: 10:46: Harder says that he tries not to make any claims before they are verifed, and has been accomplishing that goal "successfully for four years." Mar. 15: 11:13: Hoagland on NASA's interest in viewing a demonstration of the N Machine. An office at NASA/Lewis has been set up to handle inquiries about this from Congress. Apr. 5: 15:37: Hoagland on NASA's plans for Hoagland's Mars (not returning his calls for two months). Says astronauts in Houston are "seriously looking at it." 18:00: Says, "We are seeing absolute evidence that the equations and the energy we have talked about in terms of . . . the Cydonia artifacts, that energy is manifest in the workings and rotations and energy production of the various bodies that make up the solar system." Apr. 19: 18:31: Harder and Hoagland on UFOs and cancellation of Hoagland's Mars, how the government lies to us, and how the Cydonia equations could free us from the expense and wars related to oil, etc., but that "it's in someone's interest not to have it happen." Apr. 26: 21:54: Hoagland on Troy Reed's magnetic motor tied to "the geometry and equations of the monuments of Mars." Hoagland may become a part of Reed's company. He hints to Harder that they might be able to demonstrate a working model "at the Telford [i.e., FTP's headquarters] sooner than you might think." 23:55: Hoagland on Alan Feinstein (Sierra Leone "Face on Mars" stamp promoter). 26:00: Possible Hollywood TV movie on the "Monuments of Mars." Talks about his "Enterprise Mission" educational effort, based in Washington, DC. 28:29: Hoagland on alien abductees reporting "the same physics" as on Mars. 30:28: Hoagland prefers Reed's magnetic motor (that works via mechanical torque) to DePalma's N Machine. Apr. 26, 1991: 00:02: Hoagland says Bush's and Gorbachev's "body language" indicates that they may be hiding evidence of ETs. 01:34: Discusses the "Philadelphia Experiment" in light of the "hyperdimensional physics" derived from the Cydonia equations. May 24: 03:30: Hoagland on Alex Heard's Air & Space Smithsonian article. June 14: 10:21: Harder and Hoagland discuss NBC-TV's A Closer Look re: Roswell. 15:27: Summarizes why his Mars research is "critically important." Again talks about how NASA's high-resolution re-photographing of Cydonia will soon obtain proof of "a whole extraterrestrial set of ruins, a civilization right next door, and the CIA cannot hide a whole planet." Later that day (1/1/91), I wrote to Bettina Gregory. During the course of her Jan. 8 return phone call, she made clear that she and her producer had spent only one day with Harder (though some crew members spent longer). She explained the multi-topic nature of the piece she had put together, and how ABC News had previously aired stories on all its topics (including credit report problems) except for one -- the proliferation of public databases that allow people to track down others -- of which her exectutive producer had previously been unaware. He therefore decided to refocus the piece on only that one topic. When I explained to her why I had begun listening to and recording Harder's radio shows, Gregory offered that she found the subject of UFOs to be interesting, though amusing, and that Harder had been very entertaining when discussing that subject with her and her producer over dinner. As our conversation progressed, at one point she said that her forthcoming comments were not for attribution (stating that if divulged she would deny having said them) before proceeding to go into colorful detail about Harder's UFO-abduction stories and her unspoken (to Harder) reaction to them. With her blessing, I wrote to her again the next day, enclosing an audio tape of Harder's allegations about the "killing" of her report. On May 21, I received a letter from Harder accusing me of, among other things, "damag[ing] a contact [Gregory] that we once viewed as very valuable. Your comments to her were apparently not unbiased and [were] intended to do damage and hurt us to some degree. In short, your meddling may have defamed us and interfered with our prospective advantage. Your actions appear as obviously malicious." Given the legalese within Harder's allegations (especially having once before been unambiguously threatened with legal action by him), in my response I felt compelled to touch upon (though leaving out the details) something that Gregory had told me that she would deny should I ever disclose it. Gregory, quite justifiably, was not happy about it, but under the circumstances I felt I had no other recourse. In Harder's defense, in that May 21 letter he informed me, "Our letters asking why it was killed went unanswered. Bettina will also admit that to you."